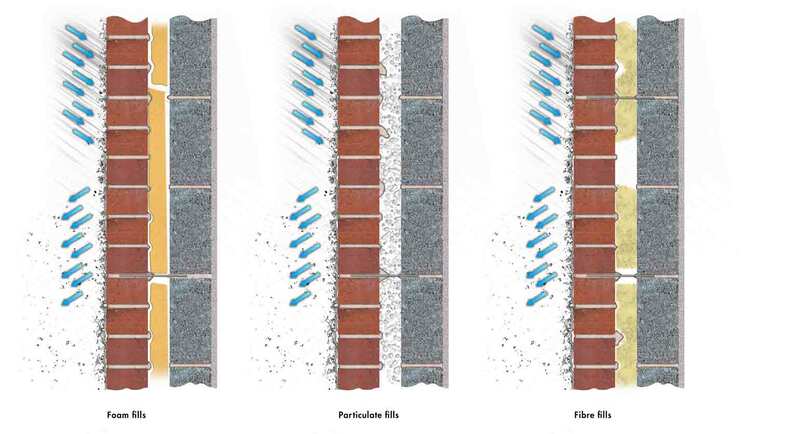 Since the initial introduction of retrofit cavity wall insulation solutions have been developed and improved and the use of some materials has been restricted to areas of lower exposure to wind driven rain. Test regimes such as those required for BBA certification ensure that systems are able to resist the penetration of liquid water. In all exposure conditions through the insulation from the outer to inner leaf of masonry. Installation is completed by trained installers and in line with the system instructions. BBA Certificates exist for systems using mineral wool, polystyrene bead insulation and polyurethane foam. A condition of these certificates is that manufacturer’s instructions require an assessment of the condition of the outer leaf to be made and the cavity itself does not have significant debris or mortar projections and that the masonry, especially the pointing and mortar beds, are in a good state of repair at the time of installation. Most system are also guaranteed to prevent the passage of liquid water for a period of 25 years and this also requires that the masonry is kept in good condition. That said problems of damp penetration can occasionally occur. Most commonly these pertain to the state of repair of the wall or the cavity debris has not been noticed. In these circumstances a heavy rain event could place stresses in terms of volumes and intensity of water on the insulation system that are beyond those tested for during certification and result in damp penetrating into the building’s interior causing condensation, mould growth and damage to decoration. Clearly in these circumstances reducing the amount of water penetrating the outer leaf will reduce the stress on the insulation system in the event of a similar rain event. Applying Stormdry breathable waterproofing cream to the outer leaf will increase the walls water resistance, alongside the appropriate maintenance of the masonry mortar and pointing will significantly reduce the water penetrating the outer leaf and reduce the stress on the system. 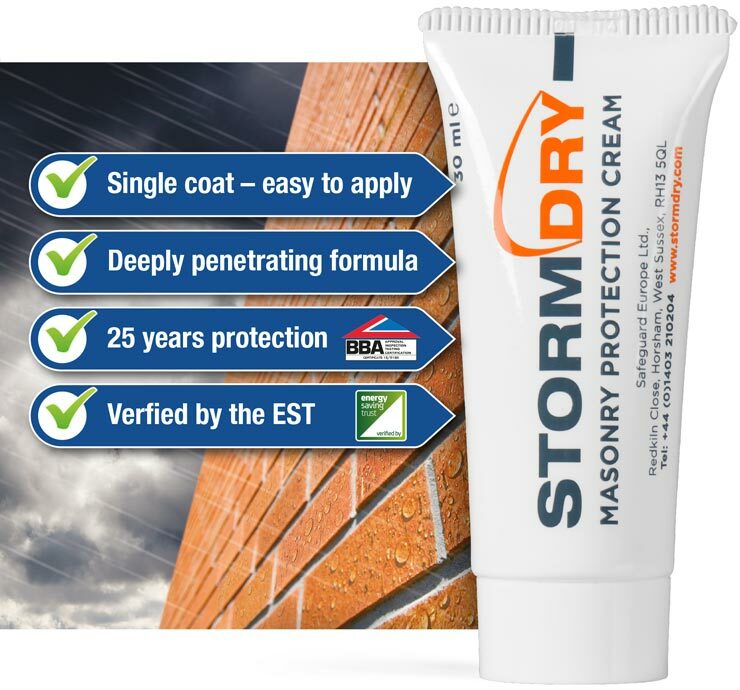 Stormdry breathable waterproofing cream will also allow any existing moisture evaporate through the masonry. In situations where cavity wall insulation has allowed damp to penetrate, this can provide a fast and less disruptive alternative to removing the insulation. 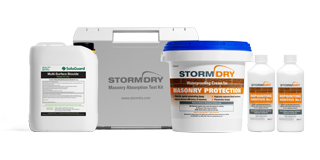 Applying Stormdry will also serve to increase the energy saving performance of any existing insulation solution. 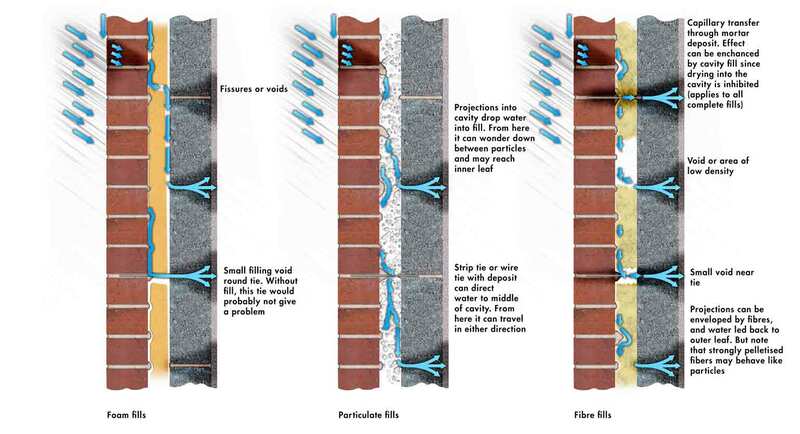 In many situations Stormdry can be used together with other waterproofing measures such as repointing using tooled flush joints to allow the use of cavity wall insulation in hard to treat cavity walls where system holders instructions might normally prevent cavity wall insualtion going ahead . Contact our technical department for details.